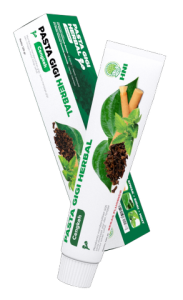 PASTA GIGI HERBAL CENGKEH (Clovers Herbal Toothpaste with Cloves) is a toothpaste made with natural herbals including cloves as its special ingredients. The toothpaste specially formulated to help maintain mouth and teeth’s health and cleanliness. Sorbitol, Calcium Carbonate, Aqua, Hydrated Silica, Glycerin, Sodium Lauroyl Sarcosinate, Propylene Glycol, Xanthan Gum, Flavour Lemon, Flavour Mint, Peppermint Oil, Piper Betle Extract, Eugenia Caryophyllus Bud Oil, Sodium Saccharin, Menthol, Sodium Benzoate. Apply proper amount of toothpaste onto your toothbrush. Brush your teeth thoroughly, then rinse your mouth with clean water.